Greetings everyone! I am back in Canada and what better way for me to slip back into my native country’s rhythms, than to visit the local farmer’s market? This weekend at my cottage, I went to my favourite stall at the modest market to buy the usual fruits and veggies that last me through the week. 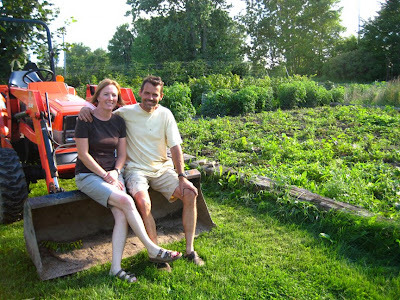 There were Mary and Chris, two organic farmers who I solely support, as they grow the most delicious, beautiful produce this side of the St. Lawrence. They are also incredibly friendly. As I was putting a handful of basil in my basket, Mary inquired whether or not I was making pesto this year. I said that I wasn’t planning on it because of the cost – even at a farmer’s market, basil can run at prices too high to buy in the large quantities that pesto requires. She told me that she and Chris were selling “bulk basil” and asked me if I wanted to stop by the farm to snip my own? Mary doesn’t know me that well, so she didn’t realize that she had just offered me the golden ticket of happiness and opportunity. A farm field trip?! Nothing makes me happier. Except free, all-u-can-eat organic vegan buffets (still haven’t found one of those). 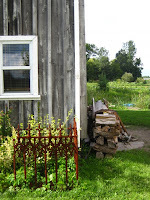 I traveled about eight kilometers out of town to their adorable little haven, situated on several acres of beautiful farmland and forest. They greeted me with warm smiles, eager to show me around the property and all the fruits of their labor. Chris proudly showed off his blackberry trellis, which he can angle according to the sun’s degree and time of year. Mary showed me her garden of lilies. They pulled fruits and vegetables off the bush and vine for me to taste, still warm from the late afternoon sun. “Now tell me that’s not the best cherry tomato (raspberry, blackberry, carrot…) you ever tasted!” Chris said excitedly. “That’s real, fresh food.” I couldn’t have agreed more. As promised, Mary handed me a pair of scissors, a bag, and we both got to work harvesting basil for my future pesto sauce. What an experience, I thought. Here I am bent over a row of the most fragrant, delicious herbs with the woman who grew them organically from seed, who tended to them each and every day. She knew each plant intimately, cared for them as the living things that they are, and respected the land where they grew. When we had harvested enough basil to sink a small ship, instead of waving me off so that they could get back to their incredibly busy schedule (the gardens don’t weed themselves! ), Chris and Mary actually invited me into their home for tea. We sat for an hour discussing their journey into organic farming, the state of modern day food, and their plans for the future. It felt so good to meet like-minded people with such dedication to reducing their environmental footprint, and above all, a deep appreciation for real, fresh food. On my way out, Mary went so far as to give me a hand-written recipe for her basil pesto, which is written below. You can use nutritional yeast instead of cheese, but I would use less than 1 cup. Try making the pesto without cheese at all, which is what I did. Then add nutritional yeast to taste if you desire a more creamy consistency. 1. In a food processor fitted with an S-blade mince garlic, cheese, nuts and salt. 2. Add clean, dry basil leaves and pulse until chopped. 3. With the machine running, add oil until it has reached the desired texture. Tips: – The basil must be dry before you process it. – Freeze pesto in ice cube trays. When frozen, transfer cubes to a freezer bag. 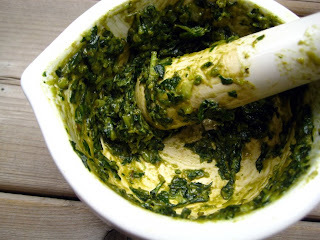 – You can also use a mortar and pestle for a more rustic-style pesto (pictured). 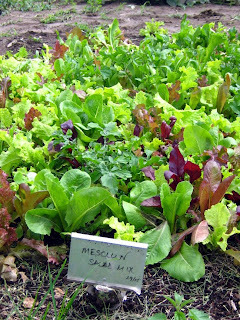 Getting to know where your food comes and the people who grow it, is empowering. Suddenly, you feel connected to your community, your environment, your food! You can appreciate what you eat on a totally different level, as you have a relationship with what is on your plate. Next time you’re at the farmer’s market, talk to the vendors, ask where they grow the food, how they grow it, why they grow it. And if you have the conviction to do so, ask if you can stop by some time. Many farms welcome visitors, even schools, clubs and interest groups. You may be surprised at how fulfilling it can be to visit to a small-scale, family-run farm, as opposed to a big box grocery store filled with anonymous goods from far off places. Instead of fluorescent lights, you get long that, lazy afternoon sun that pours like butterscotch over each and every vegetable, lighting up heirloom tomatoes like glowing lanterns. Instead of miles of aisles of brightly coloured plastic packages, you find rows and rows of brightly coloured berries, squash, melons and herbs. And instead of the cashier who is too busy scanning bar codes to even look you in the eye, you leave with warm embraces and new friends. It is truly the best way to buy groceries – ever. I enjoy reading through your article post. I really like Your article post. Love, love, love! This post makes me happy. Thanks! Not free but certainly all you can eat, definitely the best vegetarian buffet in Canada is Le Commensal. I don’t know of any resto with a comparable menu. Several in Montreal, one in Quebec City, and one in Toronto. The one in T-o is on Bay Street.